Pre Draft Report: B.J. Rosenberg was drafted out of Louisville in the 13th round of the 2008 draft. He was a 5th year senior, having redshirted the 2007 season after labrum surgery. He finished his career with the Cardinals ranked among the program’s all-time leaders in appearances (T-6), starts (1), innings pitched (3), strikeouts (6), wins (3), and saves (7). He was primarily a starter and pitched through shoulder soreness in his junior year that ultimately led to the surgery and a move to the bullpen. Prior to the draft, Baseball America rated Rosenberg as the 11th best prospect in Kentucky. Its pre-draft scouting report noted that Rosenberg took off when he was moved to the bullpen and increased his fastball up to 93-95 consistently and noted that he would have likely been a top five round selection save for the injury history and a consistent slider. Rosenberg signed quickly and made his pro debut at Williamsport. Career Synopsis: Rosenberg made an impressive debut at Williamsport, pitching 36 innings while allowing just 26 hits and 2 homers. He struck out 13 batters per nine and walked just under 4. He held right handed hitters to a .198 average. Heading into 2010, Rosenberg made his first BA Prospect list appearance, clocking in at #24, and on John Sickels’ list at #15. He was a non-roster invitee to major league camp. Unfortunately, 2010 ended up being a complete disaster for Rosenberg. He started the season as Reading’s closer, but after allowing seven ER in his first two innings, was DL’ed with a lat strain. After five weeks, he was sent to Clearwater where he posted three shutout outings before being sent back to Reading. Alas, only a week later, he went back on the DL with the lat strain once again. Once activated the second time, he made appearances for the GCL Phils, Clearwater, and Reading. All told, his 2010 amounted to just 27.2 innings pitched, and while his strikeout rate remained decent at 10.7 and his walk rate was a half walk better than his 2009 numbers, his home run rate increased up to 2.6 and his ERA for the year was an unsightly 5.20. Following the year, Rosenberg pitched in the Arizona Fall League where his 12 innings of work went about as well as the rest of his year went. 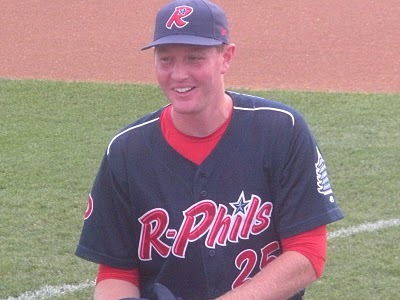 Upside: It’s unlikely that any other Phils’ prospect had a more disappointing 2010 than Rosenberg. He entered the season as a non-roster invite who some thought could be a darkhorse for the bullpen spot that eventually went to David Herndon. The reports on Rosenberg entering the season were a 93-95 fastball, a good slider, and an okay change. By the AFL, he was working more in the 90-92 range and his control had become inconsistent. The one knock all along on Rosenberg was that while he threw hard, location was key because his hard stuff didn’t have much movement. While 2010 presented a small sample size and an injury-plagued one at that, it appears that the location may have deserted him. While it’s possible that a healthy season at age 25 could put Rosenberg back in the mix as a fill-in for the big league bullpen, it appears that any number of guys have moved ahead of him on that depth chart and he’s fighting an uphill battle to ever make an impact on the big league club. I don’t have a more recent video of Rosenberg, but I’m not sure if anything major has changed with his delivery. His delivery has some effort in it, and he’s suffered one injury after another going back to the beginning of his college career. He throws hard and gets decent movement due to his low arm slot, but his command is below average. His secondary pitches haven’t developed, with his slider showing some promise, but lacking consistency. From his arm slot, a slider is the only real option, and lefties do get a good look at the ball out of his hand, which will always be an issue. This report, while it may have been accurate at the time it was written, is now out dated (nobody’s fault, I am just mentioning it). Rosenberg’s fastball is not average. While it is straight, he now throws it at between 94-98 MPH. It’s not a quite a plus pitch, but it’s well above average – say a 60 with room to be a 65 if he masters his command. His other pitches are average. The plus is that his arm strength appears to have improved, it’s probably about a 65 at this point, which means he can moonlight as a 6th starter. If there’s any guy in the Phillies system who has the ability to come from out of nowhere to become the next Ryan Vogelsong, it’s Rosenberg.